Sometimes there are attractions or shows within Walt Disney World that are popular and I sit around, scratch my head, and try to figure out what it is that makes this experience so well-liked. I will repeatedly view the show or take a ride through the experience, and still cannot understand the draw. Then, rather than bemoan the loss of space that could be used for another concept, I sit down and try to figure out what is quintessential to the experience, and how it could be made better. Today’s topic, and a show I just cannot figure out, happens to fall into this category. The Little Mermaid has always had a special place in my heart. She was, after all, the first princess of my generation, could sing her heart out, and was a redhead to boot! It would be safe to assume then that I am a fan of the Voyage of the Little Mermaid, which, as fate would have it, I am not. The show is a shortened retelling of the Disney feature film, and it seems to have trimmed the soul right out of the story. Line by line, the show features what were, once upon a time, stunning laser effects, puppets, and in theater effects. It also, however, only features two live characters, one of which never actually speaks for themselves. For a story with so much heart, I just cannot seem to find the pulse in this choppy, yet popular, show. There is another watery show on property, however, that I think the Voyage of the Little Mermaid could learn from, and that is Finding Nemo – The Musical. I have a certain fondness for the film Finding Nemo, but it does not even rank in my top five of Pixar flicks. The Musical, on the other hand, has me hook, line, and sinker. Having always had this feeling that my father and I don’t see eye-to-eye, or that I don’t measure up to his standards, I can relate to the message presented here and the music tugs at my heartstrings. So, what could the Voyage of the Little Mermaid borrow from Finding Nemo – The Musical? As it turns out, quite a bit. For starters, lets talk about hitting the high notes. The music of the Little Mermaid, which is featured in its Walt Disney World retelling, is some of the best in the Disney catalogue, including the Nemo songs. Nevertheless, I am carried away more often by the Nemo melodies when in the parks because guests are given a fuller picture of the story by the supporting narrative the links the songs together. Over at the Voyage of the Little Mermaid, the songs are highlighted, but the connecting story elements are simply not there. Let’s talk puppets for a second. If we have learned anything from productions like Finding Nemo – The Musical it is that audiences are okay with seeing puppeteers, especially when they are expressive and high-caliber actors and actresses themselves. There is no longer a need to drape these artists in black fabric and place them against a black backdrop. Instead, give guests the colorful sea stage that Under the Sea deserves, and let the acting and singing do its job of immersing the audience in the moment. On the subject of actors, the Voyage of the Little Mermaid must remember that just because a particular actor or actress doesn’t have the exact same voice as their on-screen counterpart, doesn’t mean you should have them face away from the audience and lip-sync to a prerecorded track. If the story maintains the quality and integrity of the original, the audience is going to be there no matter who is doing the actual speaking. Finally, the special effect laden Little Mermaid show may have been all the rage in 1992, with its laser sea ceiling, laser etched Ursula, and water screens, but in today’s theater simple is more. 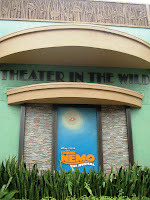 A few wire twirling scenes and larger than life sea creature puppets go a long way to telling audiences that they are under the sea, a la Finding Nemo – The Musical, as opposed to beating the guests over the head with unneeded technology that can easily date an experience. The long and short of the story is that The Little Mermaid is a tale that is worth imparting again and again. While the Voyage of the Little Mermaid stage show is popular, it does, however, leave a lot of its heart off stage. By making use of the storytelling tools and Broadway theatrics of Finding Nemo – The Musical, the Voyage of the Little Mermaid could once again be royalty under the sea. Given that the Magic Kingdom will be getting it's own Mermaid dark ride (!!) - I wonder if the Powers That Be would invest in a refresh of this show or try to use the space for something completely different? FWIW - For all it's shortcomings, I like "The Voyage of the Little Mermaid" - although I doubt I've seen it as often as perhaps you have. 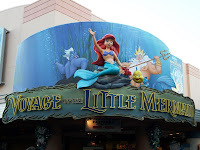 The Voyage of the Little Mermaid is indeed dated - I remember well going to it when it opened, and it started a lot of trends we have seen be honed to lead to something like "Finding Nemo - The Musical". There are puppets, effects, etc. I think it along with the Beauty and the Beast show moved Disney into live productions from the films you see at EPCOT (which I very much love). You're right that the problem is the way the story is told, because there's nothing wrong with the songs. Imagineers sometimes seem too eager to flex the technology muscle instead of making something completely cohesive. I don't see this show going away seeing as it's so popular, but perhaps it could get a significant refresh when the new Fantasyland attraction comes online. I'd be curious to know what the performer think about the show. One of the actresses that plays Ariel is on Twitter, so maybe I'll ask her sometime.